Last Tuesday, Sean and I spent a few hours with the good folks at Wolfe's Neck Farm. Situated on over 600 acres of lush fields for grazing and hay production, managed woodlands and trails, and a variety of cultivated gardens, the farm trust is a virtual wonderland bustling with activity. We could have spent all day wandering- even in the rain, but our main purpose this day was to visit the 200 turkeys being raised for meat and learn about how they are kept, raised, and cared for. With Eric and Kaitlyn as our guides, we were in excellent hands. Our first stop was the Open Barn. Open to visitors year round and stocked with a sampling of the animals kept at the farm and educational signs galore, the barn proved to be a good beginning point. We were immediately rewarded with the sights, sounds, and scent of turkeys, chickens, goats, and sheep. 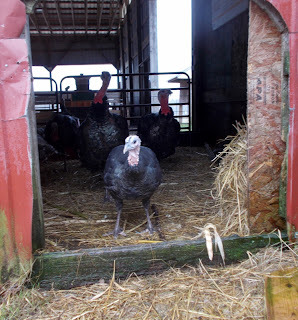 The 50 or so full grown broad-breasted/bronze hybrid turkeys living here wandered about their roomy enclosure indoors, which is connected to a large outside pasture area. Today, the turkeys preferred to remain inside instead of facing the threat of rain. Kaitlyn explained that these hybrids were picked up from a local hatchery in June as day old chicks. They are particularly hearty and grow to a decent size in 4-6 months. They are fed a high quality non-medicated, vegetarian, hormone-free feed and are given free range to pasture as they please. Though they do not fly the same as their wild counterparts, they do have limited flight capability. Here at Lally Broch, we are interested in breeding heritage turkeys exclusively, but there is something to be said for hybrid vigor. These turkeys were all healthy specimens- free of damaged feathers, bowed legs, or cloudy eyes. And, they certainly were not afraid of humans which spoke to how well they had been carefully handled through their growing months. I enjoyed listening to them call to each other. Next, Eric and Kaitlyn took us to the pasture and barn where the rest of the flock live. I was pleased to see these turkeys looked to be as healthy as the first ones we were shown. But, for a minute or two, I was a little alarmed to see all 150 birds standing inside the spacious barn outfitted with an enormous feeding station full of grain. Though there were no cages here, I misunderstood the situation and mistakenly thought that this barn was the only room they had. In fact, I was thinking through how I would broach the subject when the sea of turkeys parted and I could see the floor level exit that lead to their HUGE field. I mean ENORMOUS green pasture set aside exclusively for them to graze in. The protective fencing for the large pasture area is mobile and Kaitlyn is vigilant about rotating the fencing regularly to give the turkeys fresh pasturage. In this way, they always have access to fresh vegetation, bugs, and worms without stripping the land set aside for them. Color me impressed. The whole operation was outstanding- healthy, happy fowl cared for by caring and capable humans in a clean and inviting living area. These animals may be raised for food, but they are treated humanely and with respect. At the time of our visit, 30 or so were still available to purchase. Wolfe's Neck Farm sells their naturally raised turkeys for $4.50 per pound. The fresh oven-ready turkeys are able to be picked up on Wednesday, November 21st. 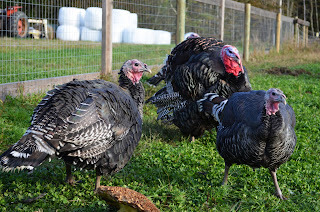 For more information or to order your own turkey from Wolfe's Neck Farm, visit their LINK HERE. Recompense Campground features 130 oceanfront, inland and wooded campsites on the shores of Casco Bay. Teen Agriculture Program that teaches among other lessons, community involvement and caring for neighbors through raising vegetables for local food pantries. To check out these and other activities, be certain to visit the Wolfe's Neck Farm web page or better yet, go for a visit in person. You won't be disappointed. Those were happy turkey birds. I would visit if I lived up that way! Wow, I'm impressed, too. Sounds like my dream farm :) Loved the video of the turkeys, by the way.